A little known fact about New Jersey is that people in the state appreciate the arts. Demolli Fine Art Studio offers full services in New Jersey. We provide the highest quality mural paintings, custom faux finishes, and decorative arts services avalaible today. Call today for a free quote. Artist Jesse Demolli painted different murals at Tuckerton Seaport museum. 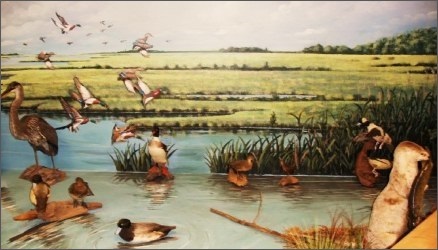 The murals are part of a new exhibit titled "Walk on the wild side" and depicts the New Jersey landscape from the shore to the pinelands. MILLVILLE - As part of its series of workshops on Italian traditional arts and crafts, The Down Jersey Folklife Center at Wheaton Village will present a two-day workshop on fresco painting with Jesse G. Demolli Saturday and Sunday. At Demolli Fine Art Studio we repair the damages of the past and we protect your art from the damages of the future. Show your holiday spirit with a custom window painting by artist Jesse Demolli. Make your business stand out with a custom window designed specially for you. 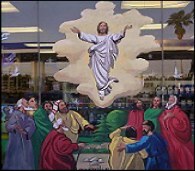 Demilli Fine Art Studio specializes in glass painting and window art. Artist finishes sction of seaport mural. Artist Jesse Demolli, of Barnegat, returned to finish a mural in the yatch club at the Tuckerton Seaport on Wednesday. Artist Jesse Demolli paints a landscape mural of the Pinelands and Great Bay at the Tuckerton seaport Museum Saturday..
TUCKERTON — Children of Tuckerton will be treated to a new enhancement to the playground at the Tuckerton Seaport this week. .Artist Jesse Demolli toiled in the playhouse located in Marshall Meadows at the seaport..